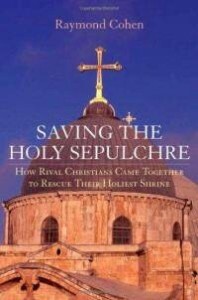 Review of Raymond Cohen, Saving the Holy Sepulchre. Oxford University Press, 2008. ISBN 0195189663. The most venerated church in Christendom is surely the Church of the Holy Sepulchre in Jerusalem, or as it is sometimes known, the Church of the Resurrection. Christian pilgrims have been coming to this shrine for over seventeen hundred years. It was near this spot that the Roman Emperor Constantine’s mother, Helena, in the early years of the fourth century is reputed to have identified the hill of Calvary where Jesus was crucified. Not far away she also believed she could locate the site of His burial in the tomb, and hence the site of His Resurrection. Unfortunately both were located under a second century Roman temple dedicated to Venus. But with imperial backing, this heathen building was cleared away, and an impressive Christian basilica began to be built. From its floor, steps led to a crypt and then down to a chapel where St Helena is said to have discovered the relics of the True Cross. The chapel survives to this day. The original Byzantine structure was replaced centuries later by an even more magnificent cathedral built when the Crusaders conquered the land. This brought under one roof – actually a huge dome – the various shrines such as the rock of Calvary, the tomb or Edicule, and numerous chapels around the ambulatory, or processional corridor around the apse, But inevitably, age and climate took their toll, as did the constant wear and tear of so many thousands of pilgrims. In 1808 a devastating fire did heavy damage, and in 1927 an unprecedented earthquake in Jerusalem alerted the authorities to the fact that repairs were urgently needed. Unfortunately, despite the basilica being so venerated, or more probably because of it, the various church communities who, over the centuries, had claimed the right to worship in the building, had never been able to agree with each other as to how this historic building should be maintained or repaired. These quarrels had been so intense that in 1757 the Turkish Sultan who ruled Jerusalem as part of the Ottoman Empire had imposed a law stating that none of the communities was to be allowed to change anything in the structure or in its furnishings and decoration. This Status Quo edict, as it was called, was enforced rigorously, so that all attempts by one or other community to undertake repairs were prohibited. The result was benign neglect, so that by the end of the nineteenth century, many observers were predicting that the building would soon collapse. But luckily in the twentieth century, it was saved, as is excellently and informatively described in a recently-published book by Raymond Cohen. The obstacles were enormous. In the first place, over the past hundred years,Jerusalem has come under the control of four competing and incompatible political regimes. Each had its own ideas as to how to deal with the Christian Holy Places, and the Church of the Holy Sepulchre in particular. The four centuries of Turkish rule came to end in 1917 when the Protestant British General Allen by rode into Jerusalem, and raised great fears amongst the Catholics and the Orthodox that the heresies of the Reformation would be imposed on them. In fact the British instead established Palestine as a Mandate of the League of Nations, and were sedulously careful to uphold the now ancient Status Quo settlement. But in 1948, Jerusalem’s Old City was occupied by the Jordanian army, and for nineteen years an international boundary ran along its battlements, only a few yards from the sacred precincts of the Holy Sepulchre. In 1967, during the Six Days’ War, Israeli forces succeeded in evicting the Jordanians, luckily without any serious damage to historic monuments. Israel immediately announced its determination to protect the Holy Places and to make them open to all comers. The possibility of an international outcry at the time, and later the desire to encourage Christian tourists, has led successive Israeli governments to adopt a strict hands-off policy. But in contrast to the Jordanians, they see no reason to become involved with the fractious problems of the Holy Sepulchre’s repairs. The initiative was therefore left to the Christian communities themselves. But it took a great many years before the age-old suspicions and rivalries could be overcome between the six groups who all claimed the right to worship in the Holy Sepulchre. The principal actors have been the Greek Orthodox Patriarchate, the Latin or Roman Catholic custodians of the sanctuary also with their own Patriarch, and the Armenian Church, asserting that it was the oldest continuous community. Lesser, but often noisy, claims were maintained by the Syrian Orthodox Church, the Copts and the Abyssinians. Over the centuries each of these had sought to obtain ownership, or at least use, of particular portions of the basilica, or had established rights to use parts of the building for its processions and services, even where ownership was disputed. Since there were hardly any surviving written records, in effect the 18th century Status Quo arrangement froze matters indissolubly. Any suggestion by one community that repairs should be undertaken was often fiercely contested – sometimes for years. Each community also suspected that, with any changes, their age-long rights might be eroded. Naturally each demanded, for reasons of prestige, that it should appoint its own chief architect. Getting these men to agree proved extremely arduous and led to many delays. In any case there was strong disagreement as to what they were undertaking. The French Catholics sought to restore as much as possible of the mediaeval masterpiece. The Armenians, on the other hand, wanted a reconstruction in a more modern style, which could include Armenian paintings and frescoes. Compromise was exceedingly difficult. Furthermore, even when agreement on each detail was reached, it all had to be approved by the respective ecclesiastical patriarchs, who in turn had to ensure support from their homelands. But finally, over the past fifty years, compromise agreements were reached on the need for urgent and constructive repairs on the now dilapidated basilica. Little by little, the unsightly mass of wooden scaffolding which had blocked out the great dome for decades, was removed. The interior regained its ancient splendour, and the dome was decorated anew with an ecumenical, if abstract, design. Largely due to the unprecedented co-operation of the local church leaders, the architects were encouraged to recruit skilled masons who could handle the delicate tasks of restoring the brickwork, the stone surrounds, the pilasters, and the paintings. Their work had to be carried out, of course, while below in the main body of the church, the daily services, processions and pilgrimages were conducted without ever ceasing. The result was that the Church of the Holy Sepulchre, which had been in real danger of collapse, was saved for posterity. This remarkable rescue effort has now been skilfully described in Raymond Cohen’s book, using as many of the surviving records as could be found, as well as his personal knowledge of the site and his many visits to see how the rebuilding project was progressing. Of course, as Cohen points out, this great achievement cannot be taken as evidence of any desire for closer Christian unity. Inter-church reconciliation is not on the agenda in Jerusalem. The weight of history and theological controversy still dominate ecumenical relations. These age-long conflicts have not been resolved. But, for this magnificent restoration project, co-operation and compromise prevailed and the adversaries came together in a common cause. Had they not done so, the Church of the Holy Sepulchre would today be a ruin. But now, it stands, as it has done for so many centuries, as the most venerable and sought-after pilgrimage site in all Christendom. We should indeed be grateful for the blessings bestowed on us by this unexpected and momentous restoration, and also thank Raymond Cohen for his perceptive record of how this achievement was finally brought about. Unfortunately, the Church is (again, or still?) in danger of collapse, according to research by Athen’s NTUA published by National Geographic, 22 march 2017.